The Unibet sports betting site is one of the most popular around, offering a sparkling range of different football betting opportunities, as well as some stunning bonuses - including a really great sign-up offer. This welcome bonus gives you a free bet, which is always something online sports betting enthusiasts like to see. When the great customer support, quick withdrawal time and superb mobile betting options are added into the mix, it’s clear to see that Unibet is a fantastic choice for anyone looking for a new online bookmaker. 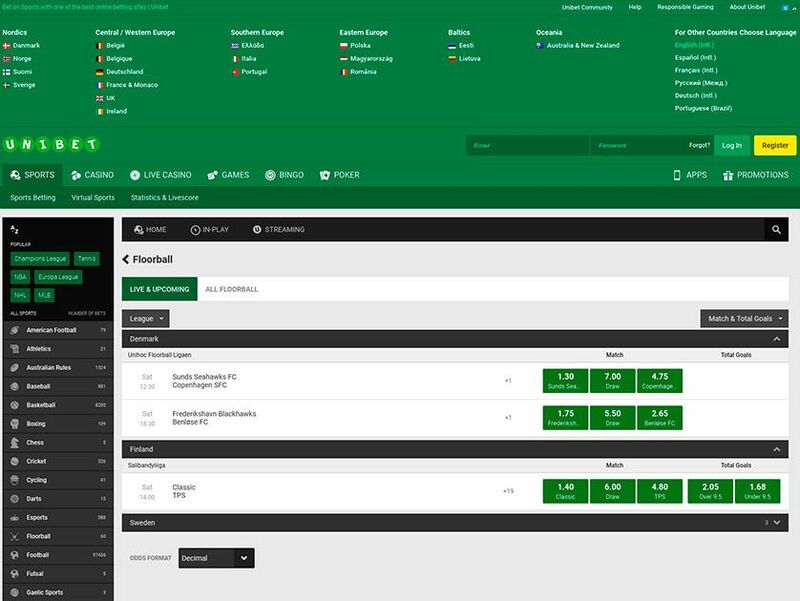 The range of different football betting options found at Unibet is spectacular. In fact, it offers more markets that the majority of other online bookmakers. This bookmaker will allow you to bet on a range of different leagues and tournaments, and they don’t just offer the obvious bets. Instead, this sports betting site also offers some more unusual bets too - perfect for those looking for something a bit different when they’re gambling. When it comes to the odds, you should find that Unibet offers favourable ones for football betting fans. This is also the case for those looking to bet on other sports as well. There’s no guarantee that they’ll match the best odds though, so check around before placing a bet, just to see if you can get a better price. Generally though, the odds are good. You’ll also find that Unibet offers a fantastic live betting experience at their site. All football matches are covered live, even including low-key matches from some of the world’s smallest leagues, and you’ll be able to bet on everything from the number of corners, through to the first goalscorer. Prices are updated regularly, ensuring they’re a fair reflection of the state of play. Unibet really do offer live online sports betting at its best. The sign-up offer at Unibet is a fantastic one. This welcome offer will give all new players their money back in the form of a free bet if their first sports bet isn’t successful. This free bet can be worth a maximum of £40. What’s more, new players will also get £10 of free money to use in the casino - great for those with diverse gambling interests. Overall, this new customer offer is a really good one, and you should definitely take advantage of it. The sign-up bonus does, of course, have some terms and conditions. The biggest of these is that you’ll have to place a bet with minimum odds of 2/5 in order to qualify, so check your selection before making your first bet. There’s also a wagering requirement to look for, as those getting the full bonus of £40 will have to make £1,000 worth of bets before any winnings can be withdrawn. These terms and conditions are pretty typical of most new customer offers. It should also be mentioned that there are no Unibet bonus codes, so don’t spend ages looking for them. Instead, the welcome offer is automatic. This means that there’s no hassle with bonus codes, which is always great to see. If you find that your bonus hasn’t worked, you’ll need to get in touch with the Unibet customer support team. It couldn’t be easier to deposit at Unibet, as there are loads of different depositing options. These include credit/debit card, PayPal, Skrill, Neteller and Paysafecard. The minimum and maximum deposit amounts vary depending on the banking option chosen. All deposits will be credited to your account instantly though, so you won’t have to wait to place your bets. When it comes to making a withdrawal, you’ll need to withdraw using the same method used to deposit. If this is not possible, another withdrawal method will need to be chosen. The withdrawal time is generally around 48 hours, which is about the average withdrawal time for the online sportsbook industry. A withdrawal could take longer though if they ask you to provide ID - something that is rare and only tends to happen when players are trying to withdraw larger sums of cash. Looking to bet on the go? If so, you’ll find that Unibet offers a superb mobile betting experience. To place your bets, just head to the site using your mobile browser. The display will then look perfect, regardless of the device you’re using. Mobile players will have access to the same markets and odds as desktop players, plus they can also claim exactly the same bonuses, including the fantastic welcome offer. It is also possible to gamble at Unibet using an iOS app or an Android app. The Unibet mobile app is free to download and is preferred by many players. This is because it provides an instant link to the site on a mobile device’s home screen, plus the entire app user experience is a really slick one. 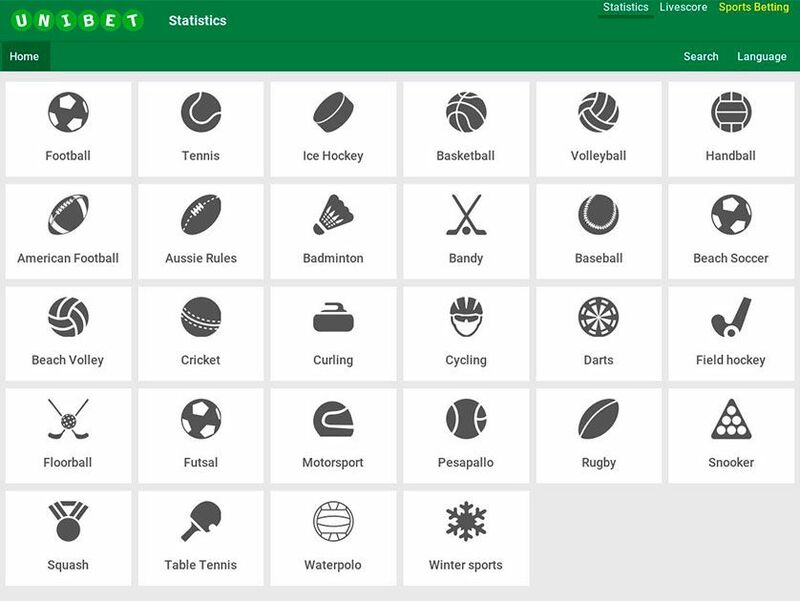 So, even if you’re out and about, you’ll still be able to place bets at the Unibet sportsbook site, which is great to hear. If you need to contact Unibet customer support (something you’ll rarely have to do), you’ll probably want to use the live chat option, which is open 24/7, with operators waiting to answer your questions. If you want to call them instead, UK players can ring a freephone number, however those from other countries will have to pay for an international call. It’s also possible to email the Unibet customer service team, however emails can take a while to receive a reply. Click on the “Help” link at the top of the homepage before contacting customer service though, as this takes you to a really comprehensive help section. 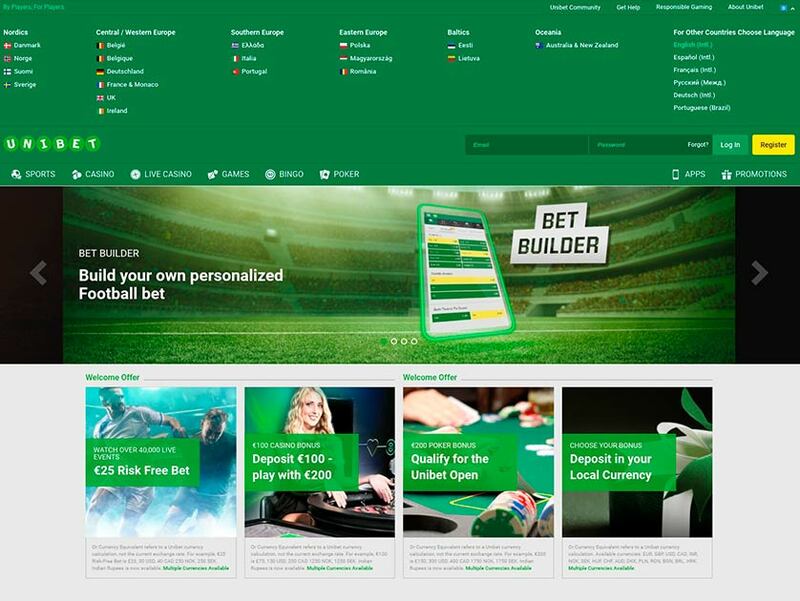 So, what do we think of the Unibet sports betting site? Well, we think that it’s superb, offering pretty much everything that someone interested in football betting could ever ask for. This means you’ll find plenty of markets, fair odds, and the chance to gamble using both a desktop and a mobile device. The deposit and withdrawal times are also really fast, plus the customer support is some of the very best around. If you’re look for a new online betting site, Unibet should be near the top of your list. Why not head there today and sign up? You can claim a great new customer offer when you do!